The Reidville Road United Methodist Men are an active group participating in several ministries within our church, our community, and beyond! Chartered in 2007, the UMM have held fundraisers highlighted by a Chili Cookoff in January which raised funds used to support the Kairos prison ministry, purchase building materials for wheelchair ramps for dialysis patients, and contribute to the Kevin Carper Memorial Fund. UMM hosts an annual golf tournament in the summer and the men have also have worked at the soup kitchen and are active in helping maintain the church grounds with mowing teams during the summer months, and are available to help others in need with yard work, handy man jobs, etc. In addition, funds are being raised for the Nothing but Nets organization, a group that provides mosquito netting for malaria prevention in needy African communities. 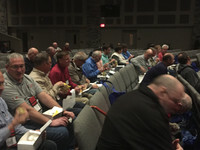 Our Men meet the 2nd Sunday each month at 7:30AM for breakfast. Contact the church office for more information!